A family wedding was the excuse for visiting Hartford’s Wadsworth Atheneum, one of America’s finest and oldest museums, predating New York’s Metropolitan and Boston’s Museum of Fine Arts by thirty-three years. The Atheneum still uses its original building, built in 1842. (See Suzanne Loebl: America’s Art Museums.) It, however, repeatedly outgrew its quarters and now consists of five interconnected structures. Elizabeth Jarvis Colt, the widow of Samuel Colt, the inventor of the revolver, donated one of these. Samuel Colt (1814-62), a Hartford native, loved to tinker and designed a pistol with a revolving mechanism (hence the name “revolver”) that eliminated the need for reloading between shots. Modern warfare as well as Columbine High and Sandy Hook Elementary School are part of his legacy. Colt and his partner Samuel H. Walker developed assembly line technology for mass-producing arms, eventually becoming inexpensive enough for individuals to buy them. Colt pistols became the weapon of choice during the white man’s conquest of the West, the California Gold Rush, the Mexican War and the Civil War. During the 1850s, the Colt Firearm Manufacturing Company sold 170,000 pocket revolvers and 98,000 belt revolvers. Ever since, powerful firearms using Samuel Colt’s revolving mechanism have been keeping America safe, expanding its power and killing countless innocents. Not surprisingly, some of these models were called the .45caliber Peacemakers, a name that matches the present-day spirit of the National Rifle Association. The Colt Cradle at the Wadsworth Atheneum in Hartford, Connecticut. In addition to money, Elizabeth Jarvis Colt left the museum the couple’s extensive collection of firearms, art, jewelry and memorabilia. Most striking is the Colt cradle suspended between posts adorned with prancing colts—stand-ins for the family name. 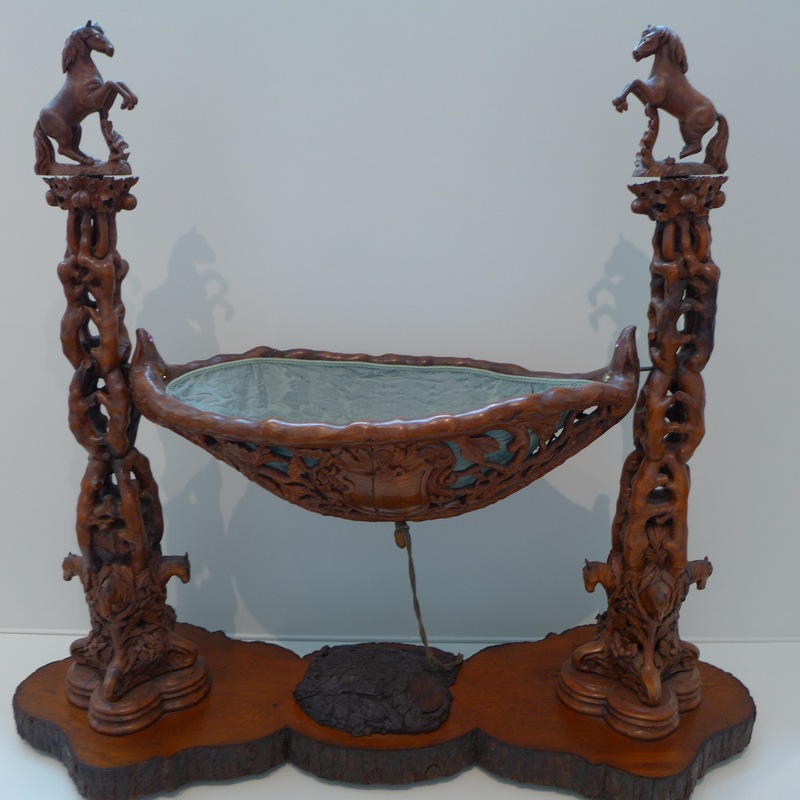 The cradle was sculpted from the trunk of Connecticut’s famous “Charter Oak,” felled by a storm in 1856. Legend has it that Joseph Wadsworth, ancestor of the founder of the museum, concealed Connecticut’s 1682 Royal charter from a tyrannical English Governor General of New England in one of the oak’s cavities. The oak became a symbol of American independence. At the museum the image of the oak, posthumously painted in 1857 by Charles De Wolf Brownell, is in a gallery adjoining the Colt memorabilia. The frame of the painting is also made from the tree’s trunk. The blue onion dome of the Colt Firearms Factory is seen in the background of the painting. The Wadsworth Atheneum’s leading collections include works from the Hudson River School, Renaissance, older and newer American art, furniture and decorative art. A. Everett “Chick” Austin, one of America’s most colorful museum directors, shaped its holdings from 1927 until 1944. During his tenure the museum received the two million dollar Sumner fund, which Austin partially used to build an impressive Baroque, Modern, and Surrealist collection. Austin also added a theater, the first in any American museum, sponsored the immigration of George Balanchine, and hosted the first public performance of his future New York City Ballet. This entry was posted in Art review and tagged a everett chick austin, american art, american art museums, art, art museums, baroque art, charles de wolf brownell, charter oak, chick austin, colt revolvers, connecticut art, connecticut charter oak, connecticut history, elizabeth jarvis colt, george balanchine, hartford, joseph wadsworth, modern art, samuel colt, samuel h walker, surrealist art, wadsworth atheneum. Bookmark the permalink.